With 2012 being a great year to be proud to be British, this was certainly fitting! 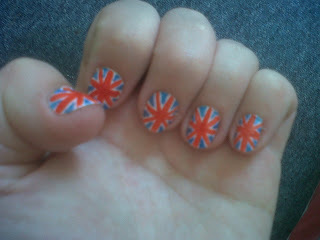 Nails for any patriotic occasion, from the Olympics to the Jubilee, Eurovision to (a personal favourite) the Great British Bake-Off. I started with a plain white as a base coat. As it was summer when I did these, I wanted to give them a lighter colour than the darker blue of the Union Jack. I then used a red striper to create the cross down the middle of each nail. Once dry, I used a pen to add in the red diagonals, and then a blue pen to finish the corners. After a top coat to finish, these are nails that definitely stand out! The nice thing about this style is that it can suit nails of any length. There aren’t too many designs out there that can be applied to short nails, but this is simple and effective enough to work on all hands, British or not! You can also try starting with a blue base coat rather than white, and then adding the white details around each red line with a pen. Either way, you’ll get a similar result. I’d be interested to try other flags for my nails. I might wait to see which country I end up supporting at this year’s Eurovision Song Contest.